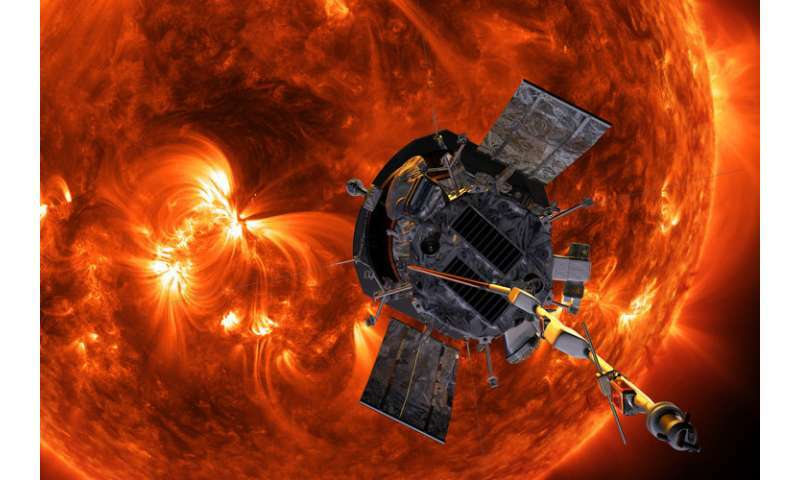 Outfitted with instruments designed and built at the University of California, Berkeley, the Parker Solar Probe will achieve a goal that space scientists have dreamed about for decades: to get close enough to the sun to learn how the turbulent surface we see from Earth dumps its energy into the corona and heats it to nearly 2 million degrees Fahrenheit, spawning the solar wind that continually bombards our planet. "This is a piece of heliophysics science we all really wanted for a long time, since the 1950s," said Stuart Bale, a UC Berkeley professor of physics, former director of the campus's Space Sciences Laboratory and one of four principal investigators for the instruments aboard the mission. "For me personally, I've been working on the probe since it was approved in 2010, but I really spent a large part of my career getting ready for it." The solar probe will travel faster than any spacecraft in history, at its peak reaching 430,000 miles per hour, and will be only four-and-a-half solar diameters, or 3.8 million miles, above the solar surface at its closet approach to the sun around 2024. The probe is equipped with a heat shield to protect its sensors from the sun's heat, which could reach 2,500 degrees Fahrenheit, nearly hot enough to melt steel. When these ions, called the solar wind, hit Earth, they interact with Earth's magnetic fields and generate the northern and southern lights as well as storms in the outermost atmosphere that interfere with radio communications and satellite operations. Accelerated to higher speeds, so-called "solar energetic" particles can pose a hazard to astronauts. FIELDS, a suite of instruments built at UC Berkeley's Space Sciences Laboratory, is one of four instrument packages aboard the probe. With the help of a six-foot boom projecting in the direction the spacecraft is moving, it will measure the electric and magnetic fields in the corona, which will tell scientists the total energy streaming outward from the sun. "If the wave-driven model is correct, then I think our measurements will be the fundamental measurements on the mission," Bale said. Two other instrument packages will be aboard the probe. WISPR, the Wide-Field Imager for Parker Solar Probe, was built at the Naval Research Laboratory and will capture visible-light images of the sun's corona directly in front of the orbiting probe. ISʘIS (pronounced E-sis) – short for Integrated Science Investigation of the Sun, and including ʘ, the symbol for the Sun, in its acronym – is led by Princeton University and will measure the energy and identity of energized electrons and ions, including ions heavier that hydrogen and helium, in order to find out how they are sometimes accelerated to nearly light speed close to the sun. "Plasma physics is really hard to study in the laboratory," said Bale, who focuses on the role of magnetic fields and ionized plasma in space, in particular around stars like the sun. "Sticking a spacecraft right in the hot plasma makes an ideal laboratory." This probe is the chance of a lifetime for Bale. Though his team will deploy booms and test instrument functions one day after launch, most of the instruments will then be turned off and won't begin taking real measurements of the corona until the probe reaches its first close approach to the sun in November. After a loop around Venus to slow down, the probe will get the closest any spacecraft has ever been to the sun, a distance from the center of the sun equal to 36 times the sun's radius (36 solar radii). Venus orbits at 155 solar radii and Mercury at 83 solar radii. "The goal of the mission is to get inside that transition region, so we get into the real corona where the flow is subAlfvénic," Bale said. "We think that boundary is at about 15 solar radii, so we probably won't start hitting it until 2021." Once inside the corona, the probe may see the jiggling magnetic field lines, or Alfvén waves, bouncing back and forth between the sun's surface and the edge of the corona, a turbulent cascade that may be the feedback loop that accelerates particles to the high speeds seen in the solar wind. "In early December, I am counting on having that first pass of data at 35 solar radii, and I am sure it will be revolutionary. There will be great new stuff in there, from what we know about previous missions," Bale said. 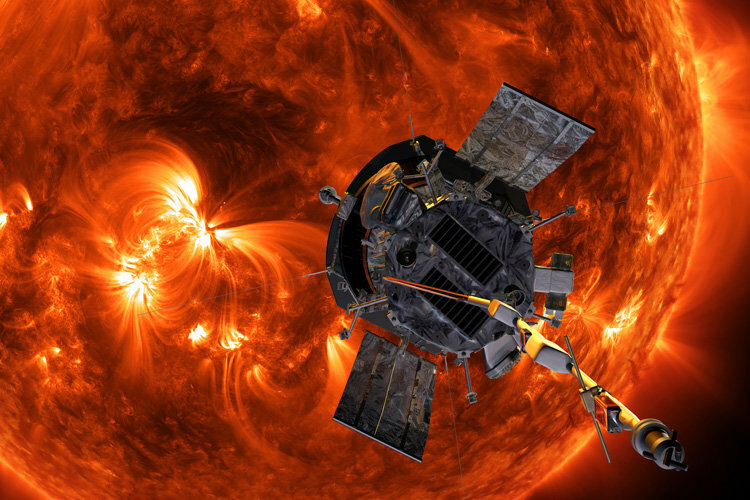 Over its seven-year mission lifetime, the probe will dip into the sun's inner atmosphere 24 times. As part of NASA's outreach efforts, more than 1.1 million people submitted their names to be recorded on a memory card that will accompany the spacecraft around the sun. The probe is scheduled for launch in the early hours of Saturday, Aug. 11, from Cape Canaveral Air Force Station in Florida, aboard a United Launch Alliance Delta IV Heavy rocket with an upper stage to boost it out of Earth orbit toward Venus.